I’m disabled and can’t walk much. My shop is tiny and most everything is within reach. Anti fatigue matts are also helpful for me. I buy the interlocking type from Sams. Knowing when to quit is the biggest factor for me. You’ve got the boots thing covered pretty well it sounds like, footwear IMHO is one of the most important factors in keeping yourself comfortable. Anti-fatigue mats are great too, but boots or shoes are always exactly where they’re needed and while they can be expensive, it’s nothing compared to surgery or further crippling yourself taking away pleasure from all of life’s activities. a comfortable height. My shoulders stopped hurting after I changed the heights on the jointer and bandsaw and the bench. Doc told me the pain was radiating down into my wrists from straining at the bench etc. When you work, you don’t realize how much you look down and work in that position. I have both the interlocking and the thick rubber mats and they work for me. As far as shoes or boots go, I would sure like to find a comfortable pair. I have bought just about every pair out there and the same result, not very helpful. Have fun, make some dust. Ive found that the made in america Keen’s have been the ticket for me. Have both the steel toe and the hicking models of these boots and the support on concrete has been fantastic. At roughly 200 usd they are not the cheepest but were worth it for me. If i wasnt building a new shop next summer i would put hardwood down on my floor to see if that would also help improve my comfort level. For me, wearing the right shoes helps but…..
My back is held together with screws and links, my hip is cobalt and other issues. I have found that having all the tools and work surfaces the right height for me is critical. I can not be handling heavy pieces very much. I also have an adjustable stool with back support and a work table with a foot rest underneath. There are just some projects with a high cost to my body and others with low cost. I have to pick the my projects with a thought about my back. Hello Redoak, could you post a picture of the footrest on your bench, sounds like something that could be useful. Id be currious on the adjustable stool also. The adjustable stool is a Craftsman that is several years old now. It swivels, adjusts up and down and the back is adjustable. The best foot rest that I have found is the upside down cat litter plastic bucket. I have tried several other foot rests but this works best for me. The small work table was made to attach to a workbench and cantilever over the edge. 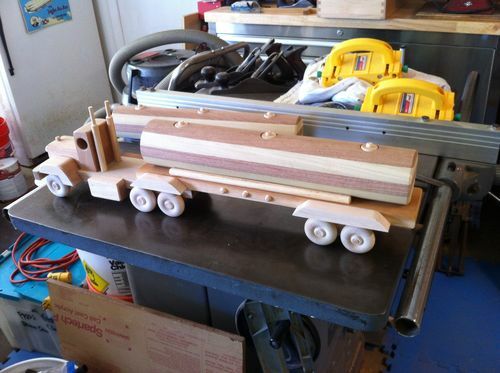 It is also built as a small downdraft sanding table. In addition, I have another bench which is just a sheet of 3/4” plywood on some plastic sawhorses which are height adjustable. I also us a cat litter bucket for a foot rest with it. I have the same stool as Redoak. One of the keys to me for long sessions without killing my back is to have 2 stools. I have the one like Redoak shows that I sit in when I’m doing something on my bench that doesn’t require standing. I also have a mechanics stool (short with no backrest) that I sit on when the tall stool starts hurting my back. Between standing and sitting on the 2 stools, I try to keep changing position enough to prevent any soreness. 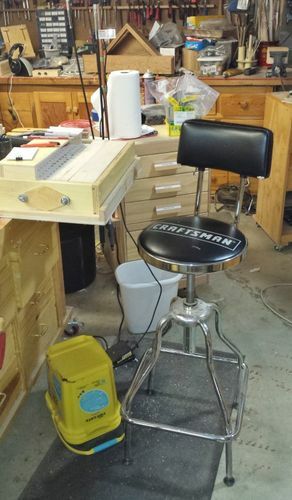 That craftsman stool sure looks like a helpful seat. I also like the kitty litter foot rest. I just got done today moving alot of my commonly used small tools (drills and whatnot) down from high shelving in an effort to to keep from reach over my shoulders too often. Think im going to try a floating floor in my shop. Wife talked me into it. She said whats the point of going to my cave if im not comfortable. 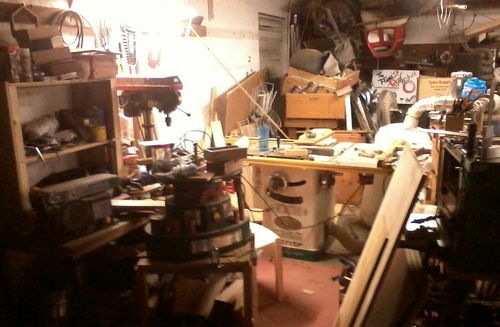 I have, happily, a full bedroom and full bath attached to my workshop. I’ll go in there every now and then and flop down on the couch, put my feet up on the ottoman and read or watch tv for a while. Or nap. That said, a full day in the shop will wear me down. Right now I ache all over, but have a big cold Bloody Mary. 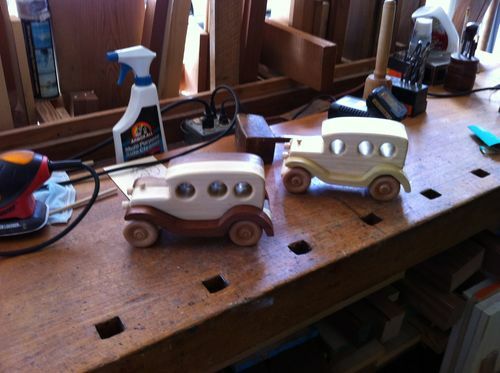 We are, as a group, very lucky to have our woodworking hobby to enjoy. I am seriously considering a Moxon vise to put work at an even higher level on my bench. I do ache if I am cutting dovetails or planning at bench height for any extended length of time. Good luck – I really hope you find ways to enjoy our wonderful hobby as long as you can. I know I plan on it. I use the same strategy as HokieKen – stand, sit, sit “different”, repeat. I have a high stool (from a chem lab), folding chair, and I stand a lot. I took an existing bench and put 2 sets of 4×4’s under the base – helped me a lot. Folding chair is more for taking a break and working on things close to the floor. Shoes are key (especially on concrete floor). Thorogood makes a comfortable boot, but not as durable as they used to be. When it comes time to replace them, I’m planning on trying Keen. They are super pricey (and I’m very cheap), but it seems the more years you put on your feet, the better you have to treat them. That is a great idea and thanks for the share. Not just looking for answers for my issues but helpful ideas for anyone especially as we age (im only 40) and our bodies start catching up with us.